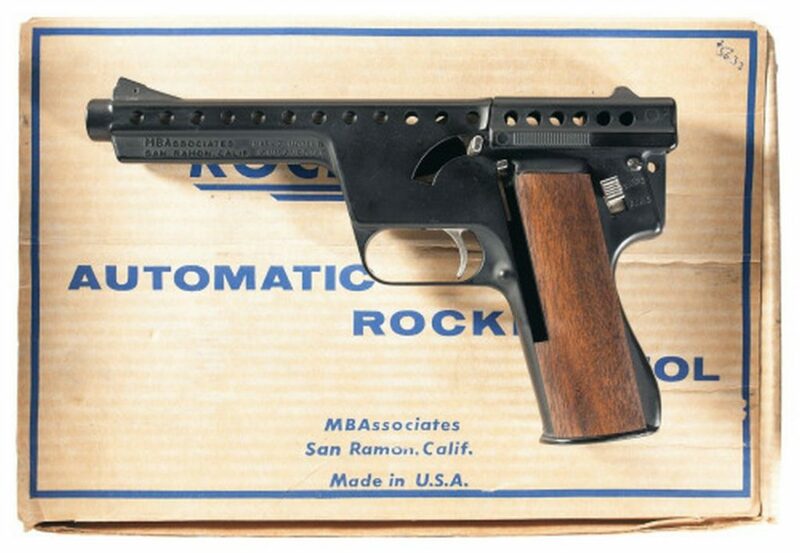 Thirty years before Robert Mainhardt and Art Biehl debuted their GyroJet rocket-powered pistol and rifle, another inventor gained some notoriety for his own, ahem, rocket gun system. In July 1934 Modern Mechanix magazine hailed a new machine gun “hardly heavier than an air rifle” that was capable of firing 700 rounds per minute. Clyde Farrell claimed his gun had almost no recoil and never overheated. According to the article, a firing pin ignited the rocket ammunition. That begs the question of how the weapon’s action cycled. Farrell’s weapon reportedly fed from an “endless chain” held together by an aluminum wire feed. This isn’t depicted in the photograph that accompanies the article, duplicated above. If the weapon used a double-action trigger to recock the action, this would mean it isn’t a machine gun. It’s unlikely the rocket ammunition would have generated enough power to also power a mechanism to pull the next round into the action. Similarly, if the rocket ignited in the barrel, then it seems unlikely that Farrell was telling the truth when he said the gun would not overheat. The short article claims that Farrell tested the weapon and sent copies to the U.S. Patent Office to “meet final patent requirements.” Sadly, I was unable to find Farrell’s patent — and, honestly, it seems unlikely that he would’ve been granted one for such a … novel idea. The ultimate fates of Farrell and his rocket machine gun remain unclear. This story originally appeared at Historical Firearms.